Who are the influential users on social media platforms? So far, the answer has been based on what the tools can measure:people with high number of followers, Klout score, etc. Having lived in the physical (as opposed to the virtual) world, we get the sense that influence must be more complex than what these metrics capture. It’s true that a person with a large following in the physical world is influential. But on one side, gathering a following in the physical world is a hugely difficult task that requires social or political standing/money/exceptional intellect; on the other, this would only be one type of influencer. Other types of influencers include experts such as medical doctors and respected community or family members. So far, social media listening tools measure the first type of influence focusing mostly on what is important, and what is easily measurable, inside the social media world but not necessarily beyond that. In this blog post, I will look into the academic research on the topic of influence in the virtual world and how it can inform the approach to measuring influence in social media. In their research publication, “Knowledge-Sharing and Influence in Online Social Networks via Viral Marketing” (2003), Rajagopalan and Sabramani describe the several differences of interpersonal influence in the physical and the virtual world to highlight that direct mapping of influence is not necessarily correct. The differences include reach due to low energy of sharing information, communication that can be synchronous or asynchronous (real-time or late reply), and delayed/non-existing vs. immediate feedback. In this paper, they describe the framework defining types interpersonal influence in viral marketing but before presenting it let me address two objections; this paper is old (published in 2003) and it’s about viral marketing. The research conducted in the paper was based on email but the usage pattern, in the majority, is equivalent to how people use social media today by sharing, recommending and using channels and pages. At the same time, organisations’ presence on social media whether to create engagement, promote the brand, answer customer service questions, or get supporter and sponsors is in essence getting users, at a larger scale, to do an action based on word-of-mouth, is the process and objective of viral marketing. Back to the framework, Rijagopalan and Sabramani defined two parameters that characterise interpersonal influence: recommender role and externalities. “Awareness Creation & Benefits Signaling” is essentially liking a post/ad which passively creates awareness of the displayed content. “Targeted Recommendation” is to actively share content with the group or specific members where the content is being recommended but passively(once). “Signaling Use, Group Membership” is displaying being part of a group for example playing Farmville on facebook and sending teaser where the recipient has to become part of the group to benefit from them. “Motivated Evangelism” is when the interaction has to be active in both promoter and recipient and both of them have to perform the action to get the benefit for example discount systems where a certain number of users have to subscribe to get the discount or even activism on social media where each of the targets have to take action for the group to benefit. Identifying these 4 types of influence allows us to differentiate between the mechanisms needed to effectively tap into influence benefits.The traditional measures of influence in social media, followers, klout score, etc., assess the ability to achieve the first type of influence , “Awareness Creation & Benefits Signaling” and to a much lesser extent the second and third characteristic, “Targeted Recommendations” and “Signaling Use, Group Membership”. This influence is the equivalent to what celebrity advertising is in the traditional advertising world. 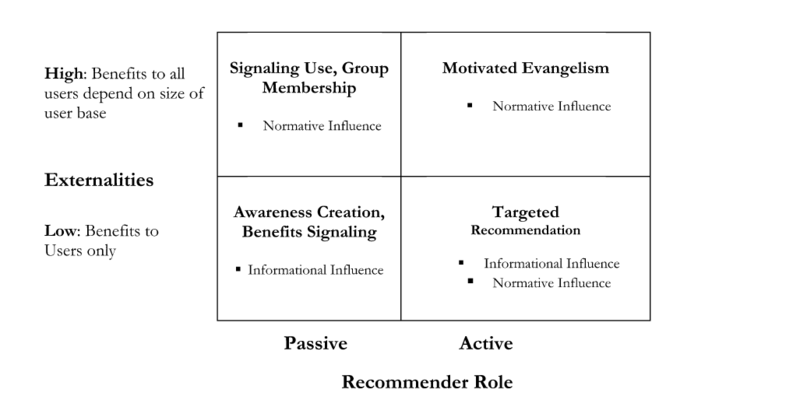 The mechanisms of influence for “Targeted Recommendations”, “Signaling Use, Group Membership”, and “Motivated Evangelism” depend on two factors: the centrality of the influencer in the network (position in the network graph) and the type of communication the influencer sends (content analysis). In a visual example, let’s look at a hypothetical network of individuals representing the target audience in the below image. If the objective of the campaign is to reach the group represented by the circled nodes then targeting “node A” directly, even if that individual does not have a high Klout score or large number of followers is the most efficient way to access that group. The centrality can be identified by analysing the target network and identifying the nodes that help achieve the desired objective. This concept is beautifully described in “Scalable Influence Maximization for Prevalent Viral Marketing in Large-Scale Social Networks” (Microsoft Research, 2010) where the researchers present the problem as a Maximisation Function of how to maximise the impact given a limited resource (budget). To illustrate the point they used a hypothetical new startup with a very limited budget trying to promote a cool application. The startup needs to decide which users to give beta excess to the application so that they tell their friends and maximise the reach of the campaign on a very limited budget. 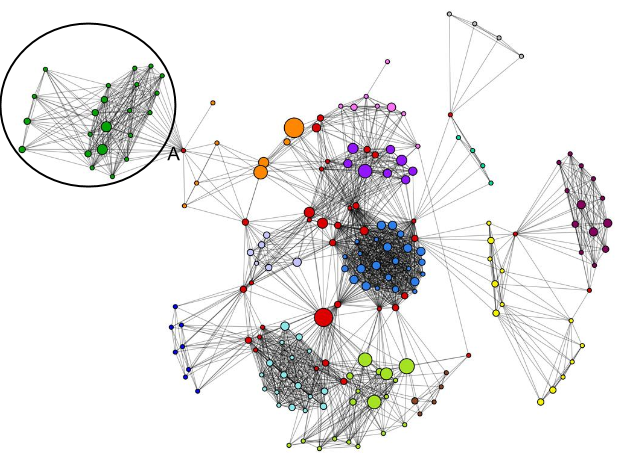 While the research was on the technical side of developing a heuristic algorithm to assess influence spread, what it indirectly showed is that efficient viral spread depends on how the nodes are connected to each other which can be evaluated using social network analysis. 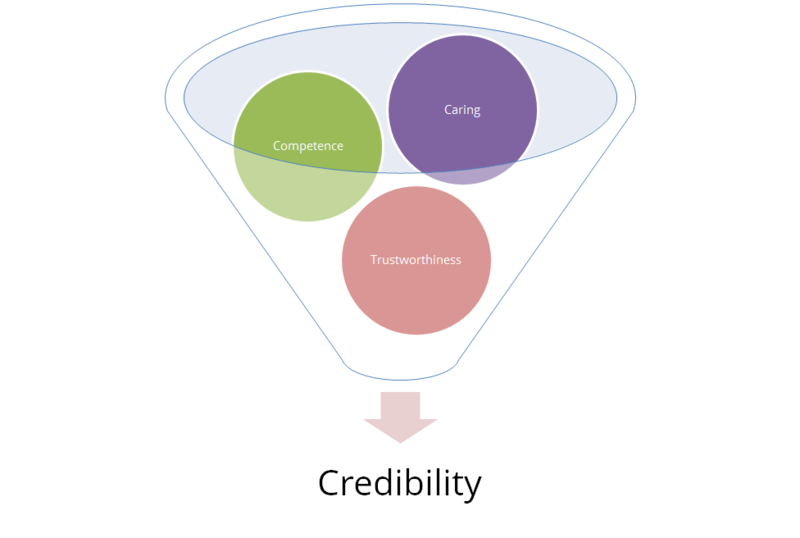 The other mechanism for achieving interpersonal influence is credibility which is measured by humans based on three element: Caring, Competence, and Trustworthiness. People’s perceived credibility increases when they share personal information about themselves. Accepting an idea required trusting the source which in turn depends on a personal communication and mainly responsiveness, accommodation, and accessibility. Counter-intuitively, the study showed that perceived credibility was higher when an expert (teacher in this case) shared social rather than knowledge items. This begins to show how complex credibility is. While Klout Score, and other similar measures, seems to present a good measure of the complex elements of credibility, it is lacking on two fronts. The opacity of the the data sources, weightings, and algorithms which makes it difficult to judge the effectiveness of the score for the specific objectives of the research. More importantly, it lacks the nuance to differentiate between the different elements of credibility previously mentioned. The more accurate alternative is an analysis that takes into consideration both the numerical elements (followers/following ratio, centrality) and the content elements ( textual analysis ) of the interaction. Having a more detailed view of social media influence allows us to build predictive models on who will be the more effective influencers for our objective – the future-Obamas of the world maybe. While this seems to be a painful analysis exercise compared to dumping a set of numbers from a social media tool, following it is mandatory when hundreds of thousands of dollars/euros/pounds are at stake for each campaign. I am not proposing to forego metrics but rather seeding the idea that influence, and thus its measures, is defined based on the objective of research rather than the other way around. This sounds intuitive and the consequence is that while tools can do some of the heavy lifting, a researcher has to decide on the needed metrics, what to keep, what to discard, and in many cases forgo the available tools to perform project specific analysis. The main choice you need to make is between looking to make evidence based decisions or looking to support the decisions you already made with evidence — a huge difference between the two.